Succulents, A Reprise: Wooden, Magnetic, and Miniature Succulent Planters! I've seen a lot of cool succulent planters online (especially on Pinterest), and over the past few weeks, I think I've been subconsciously looking for things to turn into succulent planters. You can literally make a trendy, quaint succulent-anything with practically ANYTHING. It's so easy, it's almost silly for me to even write a post, but I really wanted to share pictures of my wee little succulents! Mini copper pot magnet: I was scrounging through my dad's old toolbox for some project supplies, and found this cool copper cap that I thought would be the cutest, hipster-est little refrigerator magnet ever! Upcycled iPhone box: I've had about four iPhones since college, and every time I get a new one, I can't let myself throw the box away. Apple just does such a great job of packaging, and the boxes are seriously well-built and durable little containers. In the past, I've turned these into memory boxes or gift boxes by just pasting stickers and magazine cutouts on the outside, but I decided they were also the perfect size for a little planter! Below you'll find instructions on planting succulents in general, as well as separate instructions for each of the planter containers above! - Choice of container (any of the above ideas! Note: The charcoal and gravel are highly recommended by more experienced gardeners, but I can tell you that I've made quite a few succulent planters without the charcoal and by replacing the gravel with horticultural sand. (I was too lazy to get the supplies.) While I can't guarantee success, my planters have actually been doing great! With that in mind, if you don't have those materials on hand, you can decide for yourself if you want to test your luck without them! Gravel, 1 to 2 inches: because you're using a closed container, which means water cannot drain out, you need to create your own "draining" system at the bottom. Charcoal, thin layer (optional): This makes sure your soil stays fresh and odor-free! Soil, 2 to 3 inches: You want enough soil for your succulents' roots to be covered and to grow a little. It's a good idea to mix a little bit of regular soil with some horticultural sand, which helps promote drainage. Keep in mind: if your container is pretty shallow, you'll obviously not be able to do several inches of each layer. Just roughly maintain the ratios and order of each the layers as best as you can. Sand, thin layer: Because it looks cute and to promote drainage! Use a pen or pencil to make a little hole where your succulent will go and to push roots into the soil layer. Plant the larger ones first, and then add smaller ones around your bigger ones. Make sure there is enough room for the plants to grow - don't overcrowd your planter! Use different colored and sized ones to add variety. Sand: I love the way the horticultural sand looks on top, so I often pour a small layer over the soil once I've planted the succulents. Moss: Lots of people like to add little layers of moss on top of the soil, which you can place in between succulents with your fingers. In terms of caring for your succulents, they do like water, just not too much of it! I've been watering my succulents about once a week so that the soil is moist for a day or two afterwards. I also have found that sunlight makes a huge difference - the succulents that are along eastern facing windows and get daylight almost the entire day are much perkier and lively looking. Alright. Easy peasy! Now keep on reading below for instructions on each of the planters, in order of difficulty. They're all really easy, but the iPhone box planter requires a little more effort. (Optional): Spray the inside of your bowl with a coat of water sealant, and let dry. Most kitchenware should already have some sort of protective coating, but you can add one if you want to be safe. This helps prevent water damage. I got the copper cap ($3.50) and magnet blocks at my local hardware store. The copper cap will most likely be in the plumbing section, and you can ask an associate for the magnets. Most hardware stores sell both round and rectangular magnets, as well as adhesive magnet strips. I recommend to buy actual magnets (as opposed to the magnet strips), which are stronger, and to just choose the one that best fit your cap. Glue your magnet onto your copper cap. Let dry - make sure the magnet stays in position! Fill your copper pot according to the instructions above. You probably only have room for one succulent cutting. This will require very minimal water since it's so small and there's no actual drainage point - it'll probably only require a couple drops a week! Carve out the ditch in your cork very carefully using your knife. To start, I used my knife to press a circle in the center. Once I made that groove, I kept pressing the knife firmly around the circle, with the knife pointed slightly to the center of the cork, until the piece came out completely. Just be careful not to press too hard - you don't want to go through the cork and into your hand! I kept on digging until my pit was about halfway down the cork. Glue your magnet onto the cork. Let dry - make sure the magnet stays in position! Now, to put the succulent in, I don't think it's necessary to do all of the layers in the potting instructions at the beginning of this post. You can just add a little bit of potting soil, and have just enough room for one succulent cutting. As with the copper pot magnet, if your succulent hasn't taken root yet, be careful with sudden movement, Since the "pot" in your cork is pretty shallow and the plant is resting in the dirt more than it is grounded, it's more likely to fall out with bigger movements. So, maybe wait a couple weeks before putting it on your frequently used refrigerator door! Magnets are not limited to your fridge! I put my magnets on the post of my desk lamp - so cute and wee! Cut your plastic sandwich bag (or plastic wrap) on the side seams so that it can lay somewhat flat on the inside of your box. It's okay if it's not perfect! This is to protect your box from any water damage, so that it doesn't get soggy or gross. Once you've placed it properly, use packaging tape or duct tape to seal any sections that aren't fully covered by the plastic material. You'll want to make sure that the tape covers both the plastic material and the gap you're protecting, to make sure water cannot seep in. Cut the plastic sandwich bag so that only an inch or less is remaining over the edges of the box. Use your packaging or duct tape to seal the edges of the plastic sandwich bag over the box. You'll end up placing 4 pieces of tape, one for each side of the box. Now that the functional part of protecting the interior is finished, we can move onto the (more fun) decorating of the exterior! 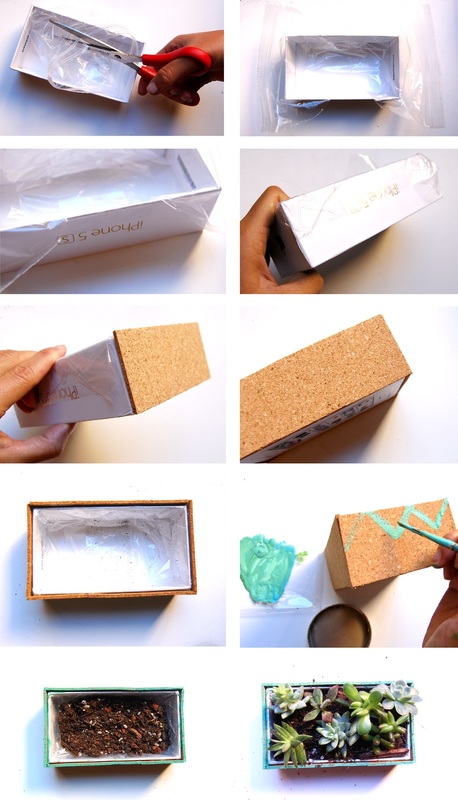 Cut your cork to the dimensions of the box's four sides. Peel the backing off the adhesive cork, and apply onto the box. Use a hot glue gun to paste the cork to the box. Paint the cork and let dry. Get creative here, use stencils or do some freehand! I did chevron stripes, and although I could have used masking tape to make more perfect stripes, I wanted to paint freehand. Let dry. Fill the box according to the potting instructions above. Done! Now that's what I call upcycling! Now, not only are these great holiday gifts, but they'd be a perfect token of appreciation for a housewarming or a (Thanksgiving) host! If you do make some planters, send me pictures! I'd love to see!